Late-breaking and archived news from Marojejy. 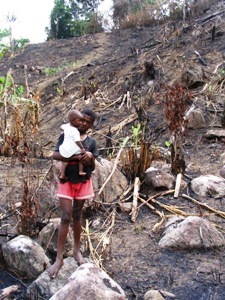 The northernmost areas of Marojejy (near Antongodriha village) have experienced increasing anthropogenic disturbance, such as slash-and-burn agriculture, in recent years. 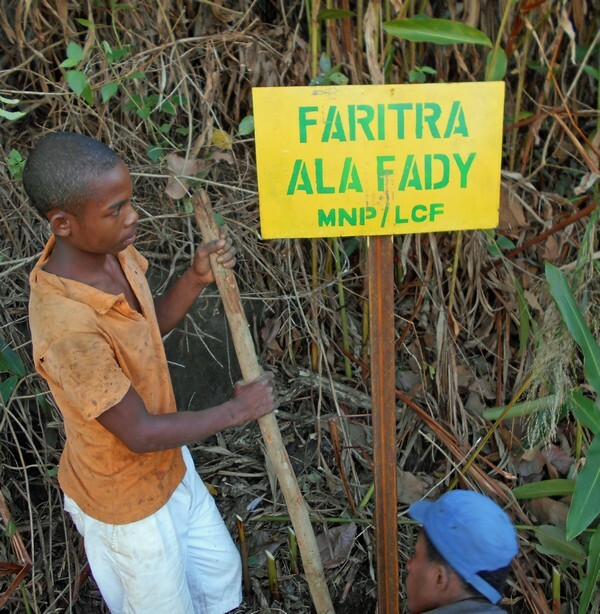 Since 2014, Lemur Conservation Foundation (LCF) has financed Madagascar National Parks (MNP) to improve boundary demarcation for Anjanaharibe-Sud Special Reserve and Marojejy National Park. This year, LCF and MNP completed the most extensive boundary demarcation to date, adding 80 new metal signs along Marojejy's fragile northernmost boundary. 32 of these metal panels are red and placed inside the park at locations that have been burned, indicating that these areas cannot be occupied or disturbed again in the future. 48 of the metal panels are yellow and will be placed on the boundary line of the reserve, deterring intrusion. 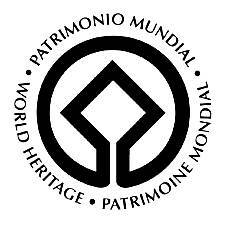 The World Heritage Committee has placed the Rainforests of the Atsinanana (which includes Marojejy National Park) on the List of World Heritage in Danger, citing ongoing illegal logging and hunting of endangered lemurs in these internationally recognized areas. The Committee noted that despite a decree outlawing the exploitation and export of rosewood and ebony, Madagascar continues to provide export permits for illegally logged timber. It also noted that countries that have ratified the World Heritage Convention are known destinations for this timber. The Committee urged the Malagasy government to take all necessary measures to enforce the decree and halt illegal logging activities. It also encouraged World Heritage State Parties to organize a high level meeting of all counties concerned to ensure that illegal timber originating from Madagascar is both banned and prevented from entering their national markets. Madagascar's plant and animal life is utterly unique in the world, having evolved in isolation since the island's separation from the African continent approximately 60 million years ago. 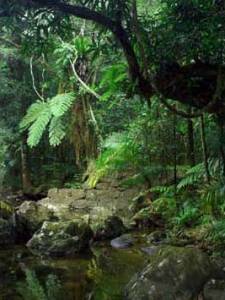 The Rainforests of Atsinanana, comprising six national parks on the eastern side of the country, are critically important for maintaining this extraordinary biodiversity and especially for the survival of many endangered species. To learn more about illegal logging in Madagascar:Wikipedia, other Link:Rosewood of Madagascar: Between democracy and conservation. Randriamalala, H. and Liu, Z. Illegal logging of rosewood from within the boundaries of Marojejy National Park (as well as Masoala National Park and Makira Conservation Area) continues. It has been conservatively estimated that between 23,325 and 46,650 rosewood trees, worth well over US$100 million, have been cut in Marojejy and the northern sector of Masoala since January 2009. These extremely dense and heavy logs have all been laboriously hand-cut and dragged out of the forest, then floated down rivers by lashing them to rafts built of many lighter logs. Once they reach roads, the logs are trucked to ports on the coast and then exported to China. The impacts of this illegal activity are heavily felt in and around Marojejy. Tourism has declined dramatically, and this, combined with very poor vanilla prices, has created dire economic circumstances for local villagers. Villagers lack money to hire teachers for their schools, and whole villages of children currently have no opportunity for education. The smoke from slash and burn (tavy) is worse this year than ever before as people prepare more land to grow food for their hungry families. 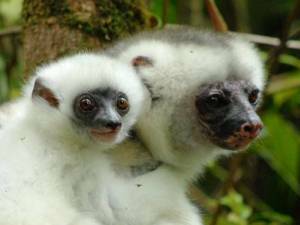 The bushmeat trade, including hunting the highly endangered Silky Sifaka, is thriving. Despite this grim news, many people are working at both local and international levels to improve the situation. The United States Congress recently passed a resolution strongly condemning the illegal extraction of resources from Madagascar and calling for a boycott of all such items. The Missouri Botanical Garden and other environmental organizations continue to push for a halt to the illicit rosewood trade. Once again, we stress that Marojejy is currently safe to visit, and we encourage you to see and experience this truly unique place for yourself. Your support for Marojejy—both for its remarkable biodiversity and for the villagers who live around it—is more important now than ever. After suffering through a dark and difficult period when the park was under siege by the “rosewood mafia” (see previous reports for details), Marojejy is once again safe and has been officially reopened for visitation. While it is good news and a huge relief that calm has returned to the region, it is extremely unfortunate that justice has not been served on the profiteers who so blatantly plundered the forest and terrorized the local villagers. Many of these unscrupulous individuals remain in the area, and continued vigilance is essential to ensure that they do not resume their destructive activities. For tourists, however, the danger has passed, and we encourage you to visit the wonders of Marojejy. The park's excellent infrastructure (trails, camps, bungalows, etc.) remains intact; the rainforest with all its incredible flora and fauna remains (mostly) as deep and primeval as ever. After this period of unrest, your visit and your support are especially important. We need to show the people of the SAVA region (and the Malagasy officials) that there is a far greater benefit to be had by preserving the forests than by exploiting them for short-term profit. Only when villagers are convinced of the enormous value of their amazing heritage—the value of their park intact, with a fully functioning ecosystem complete with lemurs and rosewood trees—will we be able to save Marojejy and the surrounding area. 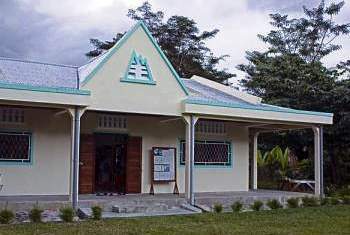 The timing of the park's reopening coincides perfectly with the completion of a new visitor center in Manantenina (gateway village to Marojejy). The center has been under construction for over four years and will not only serve as an excellent introduction to the park for travelers but also as a convenient meeting place and education center for local villagers. We thank you all for your letters of support and your monetary contributions during this difficult time. We hope to see you soon in Marojejy! The crisis continues; Marojejy remains closed to tourism. 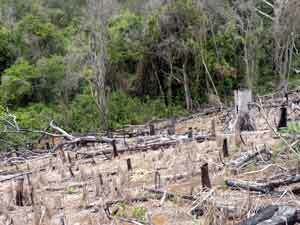 With no effective law enforcement, and faced with rampant greed and corruption, Marojejy's forests are being pillaged. Extremely disturbing reports continue to filter out from villages near the park entrance—villages now too risky for us to access. 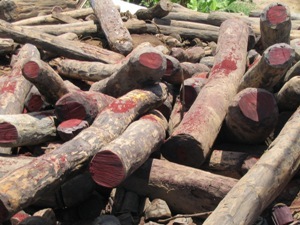 Tons upon tons of rosewood are being cut from Marojejy and the entire SAVA region, all apparently bound for China. Loggers have their run of the park, operating large camps, conducting business openly in broad daylight, threatening villagers and bribing local policemen. The rosewood mafia, based in Antalaha, is powerful, organized, and dangerous. We have also recently discovered that large-scale, organized bushmeat hunting is being conducted in old-growth rainforests near and within the newly protected area of Makira. Under the control of an individual who claims huge tracts of rainforest as his own, every type of lemur in the area—including indris and the highly endangered silky sifaka—are hunted down by packs of trained dogs and killed. The meat is smoked on site and sold throughout the region—even as far away as the nation's capital city, Antananarivo. As always, those hardest hit during this kind of chaos are the local villagers. While people in Sambava are angrily demonstrating for the right to log and sell rosewood, villagers near the park live under siege, desperate for lack of tourist dollars, intimidated into silence by the mafia. Villagers who have banded together recently to voice opposition to the destruction of their forests have been violently dispersed by the mafia firing shots over their heads. 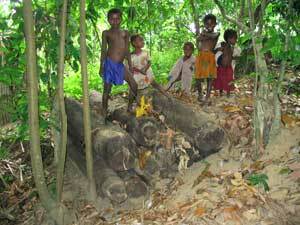 Villagers participating in the logging risk their lives and are exploited shamelessly by the mafia. Villagers receive as little as US$2.50 (2€) per day to drag logs miles out of the jungle—logs weighing an average of 200 kg each, with some weighing more than a ton. In Antalaha, Sambava or Vohémar, these same logs have fetched up to US$11 (8.50€) per kg for the local mafia and foreign profiteers (primarily from China). The roads outside the forests now are streaked with red, marks left on the pavement as the valuable dark red wood is dragged heavily away. Madagascar's last remaining old-growth rainforests are hemorrhaging to death; their blood stains the land. 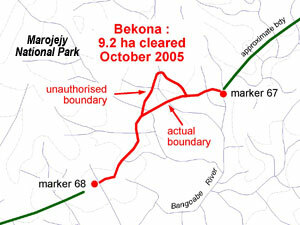 It is with great sadness that we report the temporary closure of Marojejy National Park to tourism. The closure was deemed necessary by park management due to the lawlessness that has descended over the SAVA region during this time of political unrest in Madagascar, and the resultant looting and destruction which is currently occurring within the park. In particular, gangs of armed men (led primarily by foreign profiteers in conjunction with the rich local mafia) are plundering the rainforests of Marojejy for the extremely valuable rosewood that grows there. The crisis in Marojejy has serious implications on several fronts. First, of course, is the extremely detrimental impact it is having on the park's unique flora and fauna. While old-growth rosewood trees may be the primary objective of the armed gangs, such destructive, unregulated use of the forest will certainly have an adverse effect on everything else in the park. 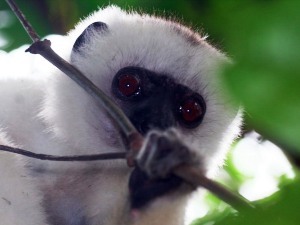 Most worrisome is the well-being of the highly endangered Silky Sifaka, a lemur found only in the rainforests of Marojejy and the surrounding area. But the crisis is also having a devastating effect outside the boundaries of the park itself. With armed militia descending on local villages and death threats being issued, people live in fear; communities are divided, and families are pitted one against the other. Many local people who depend on tourism—guides, porters, shopkeepers, hotel and restaurant personnel—now live in limbo. With no other means of support, some turn to the lucrative rosewood trade. Your support for conservation in Madagascar is more important than ever during this period of turmoil. While you might not be able to visit some of these beautiful areas right now, we hope you will not forget them, and that you will continue to work for their preservation. We will keep you informed of changes in the local situation as we learn of them. As of January 19, the exportation of precious wood is once again legal in Madagascar. The consequences of this are enormous. In the Marojejy and Masoala area alone, over 500,000 logs of ebony, rosewood and palissandre which have been stockpiled for the past two years are now free to export. In addition, many more logs are mysteriously appearing from places where they were illegally hidden (in some cases buried or submerged underwater). Some unscrupulous businessmen are even sending crews out to cut down more precious wood from protected forests, especially from Masoala National Park. For more information, see L’Express de Madagascar, 24 Jan 2009 (PDF in French only). Unfortunately, the recent political crisis in Madagascar has made the situation even worse. 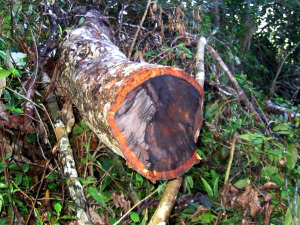 Taking advantage of the terrible looting and riots which occurred in Antalaha on 27–28 January, rosewood "terrorists" raided the Water and Forests Headquarters there, stealing all the precious wood (estimated at 500 metric tons of logs) that had been previously seized by the government. These distressing events will have serious long-term impacts on Madagascar's environment. With the door now wide open for harvesting and exporting precious wood, the last remaining virgin rainforests are increasingly vulnerable. And with the country in political turmoil, the tourism industry is in shambles, resulting in the loss of desperately needed funds. The future looks increasingly bleak. A team of researchers coordinated by Erik Patel from Cornell University in the USA has recently returned from a 35-day field study conducted in the remote northwestern region of Marojejy. Although the data collected have not yet been thoroughly analyzed, some preliminary results can be presented here. The best piece of news is that 16 new groups of silky sifakas, consisting of approximately 80 individuals (including infants and juveniles) were discovered. This is far more than expected, and is an extremely significant and welcome finding since the species is so critically endangered. The bad news, however, is that the research team found widespread evidence of anthropogenic pressure in the areas of the park they visited. Evidence included slash-and-burn agriculture, large stumps where trees had been cut, honey extraction, large numbers of bushmeat traps, and recently used hunting camps. It is still unclear whether this degree of human disturbance occurs all around Marojejy or only in certain places. What is very clear, though, is that further reconnaissance trips are needed as soon as possible, along with extensive conservation action, especially in villages adjacent to the park such as Antsahaberoaka and Antongodriha. In our last news update (see below), we were excited about several new projects that had been initiated to improve Marojejy’s infrastructure. Some progress has indeed been made on new trails and some new buildings, such as a new visitor center; however, progress is extremely slow. The visitor center is still quite empty, waiting for the interior design to be finished. What was scheduled for completion in 2008 is now scheduled for 2009. As Madagascar's rainforests become increasingly fragmented, Marojejy becomes more and more valuable as an "island of biodiversity" and, as such, continues to attract great scientific interest. Erik Patel and several graduate students from Cornell University in the USA have recently conducted several surveys of lemurs in the park and are planning a more extensive survey of the highly endangered Silky Sifaka (Simpona) in the region. Very little is known about the population and distribution of this rare lemur, which is thought to exist only in Marojejy and the nearby protected areas of Anjanaharibe-Sud and Makira. 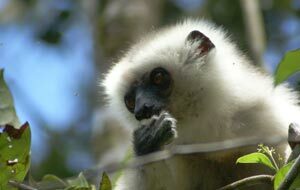 Read more about the Silky Sifaka. Several improvements to Marojejy's infrastructure are currently underway. One involves a significant upgrade to Camp 1 (Camp Mantella), with a new cooking and eating shelter, new toilets, and an expanded area for pitching tents. Another major project in progress is the construction of several new trails to outstanding viewpoints (Ambavaomby and Ambatotsondrona) in the park. These new trails will not only open new areas of the park for carefully controlled visitation but will help disperse use and take some of the pressure off the summit trail (currently the only trail open to visitor use in the park). 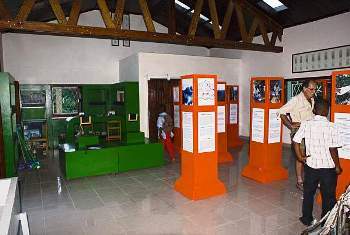 On 27 June 2007, Marojejy was inscribed on UNESCO’s World Heritage List as one of six national parks in Madagascar’s “Rainforests of the Atsinanana.” This highly deserved recognition comes at an especially critical time for Marojejy. We have recently learned that small amounts of precious wood are still being illegally cut and removed from park lands (under cover of darkness at night), and that some areas of the park along the remote northern boundary (near Andrahanjo) have been deforested for agricultural purposes and the cultivation of marijuana. The area covered by primary rainforests within the park continues to shrink, little by little. We sincerely hope that Marojejy’s new status as a World Heritage Site will bring increased attention to the management problems which continue to plague this extremely important and beautiful place. 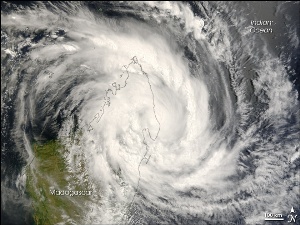 In mid March and early April, two cyclones (hurricanes) slammed one after the other into northeastern Madagascar. 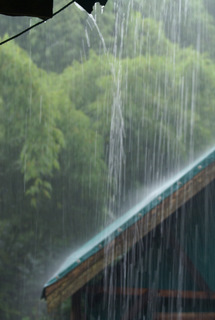 While the area around Masoala National Park was very heavily hit, the Marojejy region did not feel the brunt of these storms quite as hard. Minimal damage to park infrastructure has now been cleaned up and the park is open for tourism as normal. Unfortunately, the rice and vanilla crops in the area were badly damaged, which could seriously affect the local economy and result in even greater hardships for villagers than usual. 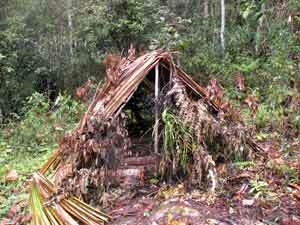 Of course, this puts more pressure on the park as villagers seek alternative food sources and other means to survive. The past decade has seen a dramatic increase in the frequency of cyclones hitting Madagascar, culminating with six during this season alone. This increase has been felt particularly strongly in the northeastern part of the island, where recovery from one cyclone is hardly possible before another hits. The future may well hold more of the same: unstable weather patterns due to global climate change are expected to produce similar devastating cyclones in Madagascar with increased frequency. 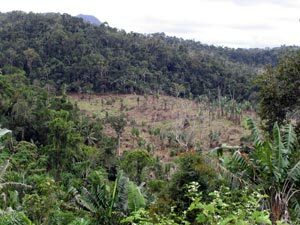 The illegal removal of precious woods out of northeastern Madagascar continues unabated. 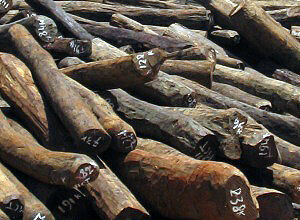 On 27 January 2007, the Madagascar Tribune reported that rosewood worth in the millions of US dollars had recently been seized at the port of Vohémar, en route to China and Singapore. Threats were made to police by the traffickers, and it is widely believed that a number of Chinese businessmen in Antalaha and Sambava (operating with the support of highly placed authorities) are involved in this lucrative and illicit trade. Because there is so little primary lowland forest left in the area around Vohémar, it is highly likely that much (if not all) of this rosewood comes from protected areas such as Marojejy and Masoala National Parks. What future do these children face? The hills surrounding Marojejy are once again on fire, and the air is thick with smoke. This is the season of tavy, when local people take advantage of the month or so of dry warm weather to slash-and-burn the land for rice cultivation. More land is being burned this year than has been burned in many years – a direct result of declining economic conditions and a skyrocketing population. Much of the land being burned is immediately adjacent to the park. It is understandable that people living in extreme poverty will attempt to grow food wherever and however they can, especially using traditional methods that are deeply ingrained in their culture. But slash-and-burn agriculture is not a long-term solution. In the Marojejy area, there is little land left for increased cultivation outside of the protected zones – the forests have been cut right up to the park boundaries. With repeated slash-and-burn, erosion is increasing and soil nutrients are being depleted. Unless we find sustainable alternatives soon, Madagascar ’s children face a very bleak future. After more than a year of serious problems (including corruption, threats, and ill-will), the new ANGAP staff in Andapa, under the impetus of a new director, seems to finally be working for the good of the park and the local people. The trails in Marojejy have been cleared and repaired all the way to Camp 3, camp maintenance is being carried out in partnership with Andapa’s Alliance Française, and the fight against hunting and deforestation in protected areas is being taken seriously. Half of all entrance fee receipts are finally being distributed to the local villages for development projects. We are encouraged by this progress, and hope that it is not simply a temporary show. On 13 March, an American Peace Corps Volunteer who has worked for ANGAP in Marojejy and Anjanaharibe-Sud for the past two years was evacuated from the area. This emergency measure was taken after the U.S. Embassy in Antananarivo was notified that the volunteer was the subject of death threats and his life was in danger. The threats are almost certainly prompted by revelations of corruption in ANGAP and the Ministry of Environment which have been exposed by the volunteer. The threats follow a number of acts of intimidation against the volunteer, including forcible entry into his residence in Andapa and the theft of many important park documents. They also follow death threats against the family of the former director of the park, who was forced to resign his post last month. We are encouraged that park officials are finally responding to this kind of blatant corruption and hope this is not merely a token gesture to appease aid organizations. It is strongly suspected that both land and rosewood from the park have been sold by several other park officials as well, but none of these other cases are currently under investigation. With the re-opening of the legal exportation of precious woods from Malagasy ports, the traffic in rosewood from Marojejy has begun once again. Stockpiles of rosewood that were almost certainly cut illegally within park boundaries are now being surreptitiously hauled from villages around the park to Sambava and Antalaha; from there they will be shipped overseas (mostly to the Asian market, especially China). Even though park officials know the whereabouts of these rosewood stockpiles, no attempts have been made to verify their legality. And now that there is an authorized market for this valuable commodity again, it is likely that we will see renewed cutting of rosewood within the park. A number of areas within the boundaries of Marojejy National Park are currently being cleared by local residents for agricultural purposes. Vegetation has been cut and is now being allowed to dry before it is burned during the dry season in October and November. 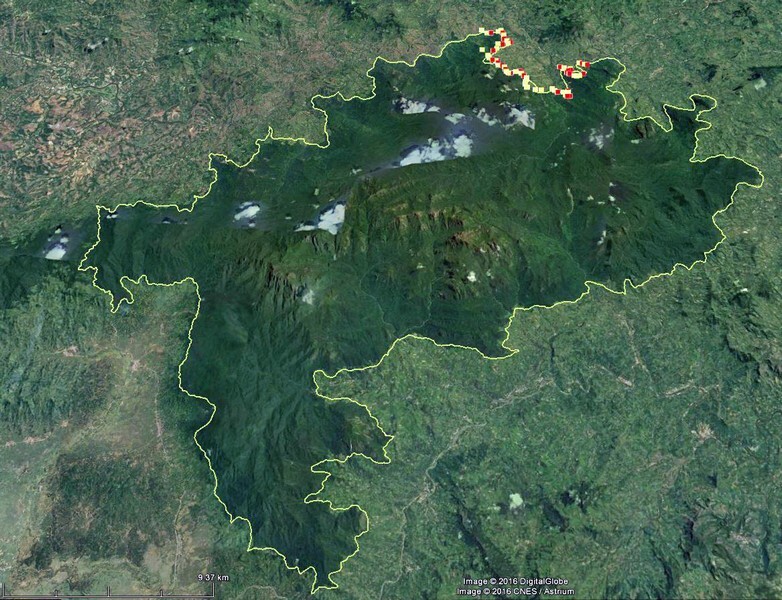 While some of these areas are second-growth forest (previously cleared during the political unrest of the late 1980s), other areas are virgin lowland rainforest. Especially troubling is the fact that park boundary markers are being physically moved toward the interior of the park, sometimes with the approval and/or assistance of dishonest park employees. 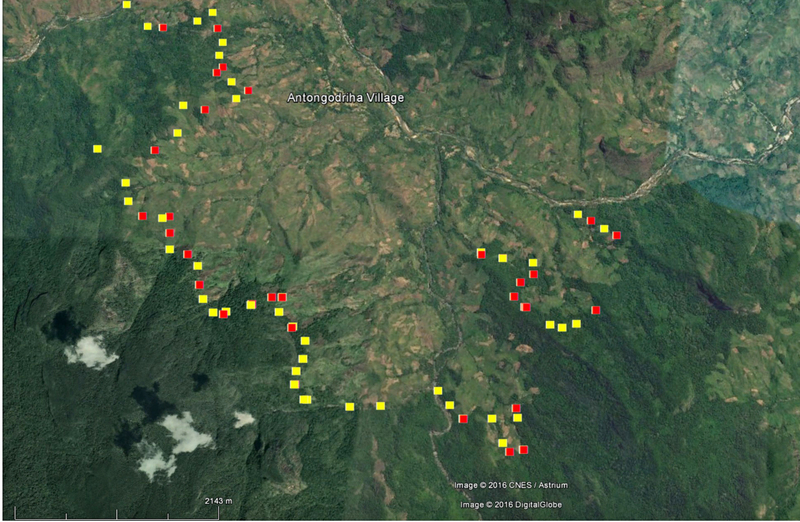 Although the park boundary was GPS surveyed several years ago, the data from these surveys have been lost (along with numerous other important documents), and park management must now rely on local villagers’ memories for the boundary’s actual location.